Yerba mate tea boasts some surprising health benefits and may even replace your morning cup of Joe. Much like green tea, yerba mate tea is rich in polyphenols and antioxidants, and is quite tasty to boot. Coffee Is King!… Or Is It? Kidding aside, we all crave that delicious, robust flavor (which is why many people even get out of bed in the morning). And if you’re in a midday slump (or just tired from staying up all night with a fussy baby), an afternoon cup can often provide enough energy to help make it through the rest of the day without falling asleep. Oh yeah, and it even has some antioxidants that provide health benefits! Then there’s the social aspect … sipping a latte with friends, or sharing a pot with coworkers. But as I learn more about all things health, I’m more and more convinced that variety is key to a healthy diet and lifestyle. Changing up your form of exercise, taking a break from certain supplement, or cycling off coffee can go a long way to keeping the body in balance. 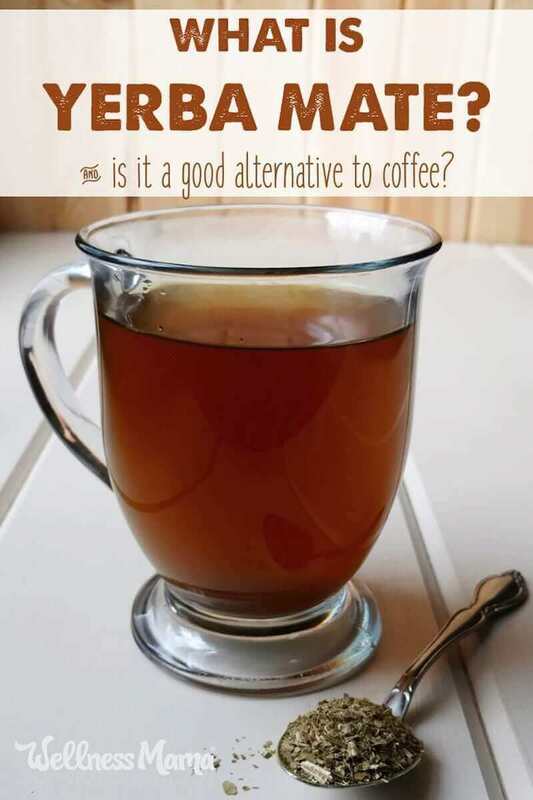 For this reason I put down the coffee every once in a while and reach for coffee alternatives instead. Yerba mate tea is made from the leaves of the ilex paraguariensis plant. In South America, drinking yerba mate tea (often from gourds) is a common social pastime. It has an impressive host of health benefits and can satisfy in much the same way that coffee does. It has a unique, rich flavor that’s similar to black or green tea. Yerba mate does contain the stimulants caffeine and theobromine (also found in chocolate). Coffee contains about 85 milligrams of caffeine per 5 ounce cup, and yerba mate has slightly less at about 78 milligrams. Yerba mate also contains anti-inflammatory saponins, chlorophyll, and potent antioxidants. This tasty drink has some surprising health benefits! Yerba mate protects DNA from free radical damage and has a high antioxidant capacity. It’s been shown to help protect against breast and colon cancers and has anti-tumor properties. One study found that those who consumed the most yerba mate tea, were least likely to have breast cancer, even when other factors like antioxidant consumption from other sources were accounted for. Yerba mate not only protects against cellular damage but also protects the heart. This tea benefits the entire cardiovascular system. It works in part by dilating the blood vessels for better circulation. Yerba mate stimulates the central nervous system to bring about both energy and focus. The tea protects the brain, improves memory, helps reduce depression, and can even help protect against Alzheimer’s disease. Yerba mate was even shown in one study to reduce the amount and length of epileptic seizures, while reducing oxidative damage in the brain. Yerba mate drinkers can also improve hypothalamus function, a part of the brain that produces and regulates hormones in the body. When sugar is consumed, a process called glycation happens. Glycation causes damage to the body’s proteins, which can result in inflammatory diseases like arthritis, fibromyalgia, and dementia. Yerba mate tea has potent anti-glycation actions. One study found it prevented glycation formation by a whopping 83%. This isn’t a free license to eat a bunch of sugary treats, but yerba mate can help prevent damage from the fructose found in fruit and other sources. Yerba mate has long been used for weight loss, and studies have shown it prevents body weight gain and reduces total body fat. It helps the body more efficiently burn fat and curbs the appetite for a feeling of satiety. Even more impressive, yerba mate also inhibited visceral fat, the kind that collects along the waistline and abdominals. Visceral fat can surround vital organs like the liver and heart, and can contribute to heart disease, diabetes and other serious issues. Not only does yerba mate reduce potentially diabetes causing visceral fat, but it also improves insulin levels. In one study diabetics and pre-diabetics drank yerba mate, and some of them made diet changes. Blood glucose levels improved across the board for all groups, but even more so for those who tried to eat healthier. The “healthy” diet they adopted followed food pyramid guidelines and was low in healthy saturated fats, so maybe if they ate a traditional foods diet they would have had even better results. Yerba mate works in much the same way to protect the liver. It helps to reduce oxidative damage to the liver’s cells. It also helps protect the liver against fatty liver disease and pancreatitis by balancing triglyceride levels. There are a few things to be aware of before switching ditching the coffee for a yerba mate, however. Yerba mate contains something called polycyclic aromatic hydrocarbons. These hydrocarbons are the same cancer-causing compounds found in tobacco and charred foods. Depending on growing conditions, yerba mate can also contain varying levels of heavy metals like aluminum and lead. To put this in perspective though, the average lead concentration in yerba mate tea is less than half of what the EPA considers safe for drinking water. Green tea, coffee, and even fruits and vegetables also contain varying amounts of heavy metals in them, since it’s naturally abundant in soil. And while yerba mate tea does contain low levels of certain carcinogens, it’s also very high in cancer-fighting antioxidants. Traditionally, yerba mate tea leaves are brewed in hollowed out gourds and sipped through bombillas, a metal straw with a strainer at the bottom. The gourd is passed around and the water refilled up to 20 times. The traditional recipe results in a very strong beverage, as the gourd is packed with leaves. But never fear, gourds not required! You can make yerba mate at home in a French press, coffee pot, or with a simple household strainer. Generally, for every 1 cup of water use a heaping 1 teaspoon of ground yerba mate. To make yerba mate tea in a coffee pot, use 4 TBSP of the leaves for a 12-cup coffee pot and brew as usual. If using a French press, add yerba mate tea to the press, then pour very hot but not boiling water over it. Let this steep for 3-8 minutes, depending on preference. If using a strainer, add the yerba mate to a pot of very hot water, cover, and let steep for 3-8 minutes. Use a fine mesh strainer to filter out the leaves and pour into a cup. Yerba mate tea can be enjoyed with a little raw cream or milk. It can also be sweetened with maple syrup, raw honey, or stevia if desired. You can even serve it cold, traditionally called tereré. Are you a yerba mate tea drinker? Do you think you’ll start now after learning the benefits? Santos E. C. et al. (2015). Anxiolytic-Like, Stimulant And Neuroprotective Effects Of Ilex Paraguariensis Extracts In Mice. Neuroscience, 292, 13-21. Conceição, E., Kaezer et al. (2017). Effects of Ilex paraguariensis (yerba mate) on the hypothalamic signalling of insulin and leptin and liver dysfunction in adult rats overfed during lactation. Journal of Developmental Origins of Health and Disease, 8(1), 123-132. Arçari, D. P. et al. (2012). Antiobesity Effects of yerba maté Extract (Ilex paraguariensis) in High?fat Diet–induced Obese Mice. Obesity, 17 (12), 2127-33. Branco Cdos S. et al. (2013). Anticonvulsant, neuroprotective and behavioral effects of organic and conventional yerba mate (Ilex paraguariensis St. Hil.) on pentylenetetrazol-induced seizures in Wistar rats. Brain Research Bulletin, 92, 60-68. Alkhatib, A. (1970). Yerba Maté (Illex Paraguariensis) ingestion augments fat oxidation and energy expenditure during exercise at various submaximal intensities. Nutrition and Metabolism 11, 42. “Mate Gourd Ceremony.” www.Guayaki.com. (Yerba Mate Brand).